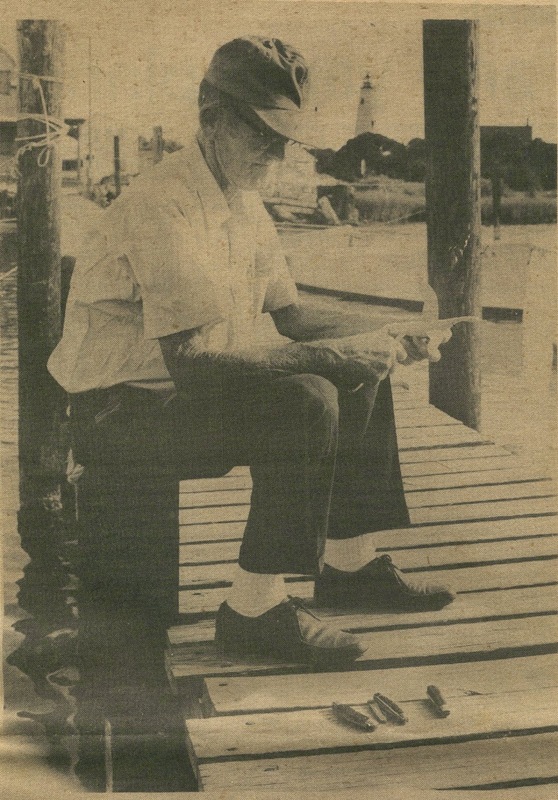 The August 2, 1974 issue of The Carolina Beachcomber ran a photo of Ocracoke's Methodist minister, Jimmy Creech, and a brief article about the Creative Arts Program Jimmy initiated. "Popular preacher Jimmy Creech of Ocracoke Island, leader of the creative arts program for the Ocracoke United Methodist Church, is excited about two coming attractions. First, Ira David Wood, executive director of Stage '75 drama production group of Raleigh, will be a guest artist. 'A truly professional artist in dramatics, having starred several years in 'The Lost colony' as Old Tom and Sir Walter Raleigh, David brings to us an acting talent rich in perception and vitality,' Jimmy said. Attraction number two is well-known pottery craftswoman, Alice Proctor." Ocracoke's tradition of theater, crafts, and music continues. Be sure to seek out shows and performances whenever you are on the island. Summer (and Winter) Theater has been an important part of island life for quite some time. In the summer of 1974 Julia Howard's three act musical, A Tale of Blackbeard, began it's run of 9 seasons in the course of 20 years. The play built upon a long tradition of plays, skits and variety shows that were staples of Ocracoke Island evening entertainment for decades. As many of our readers know, A Tale of Blackbeard has been revived this season with a cast of talented local actors and actresses. Clever lyrics and catchy tunes complement the script which portrays the last days of the infamous pirate captain who lost his head just off shore in 1718. Salty sailors, coquettish village girls, and a prominent village family provide drama, conflict, and romance. This summer my son Stefen Howard has been working on a web site dedicated to preserving the history of this iconic Ocracoke Island production. The site is a work in progress, but Stefen has already published images from many of the performances, as well as vintage newspaper clippings, programs, and historical sketches. Take a look at www.ataleofblackbeard.com now...and later this summer for updates from the 2014 season. 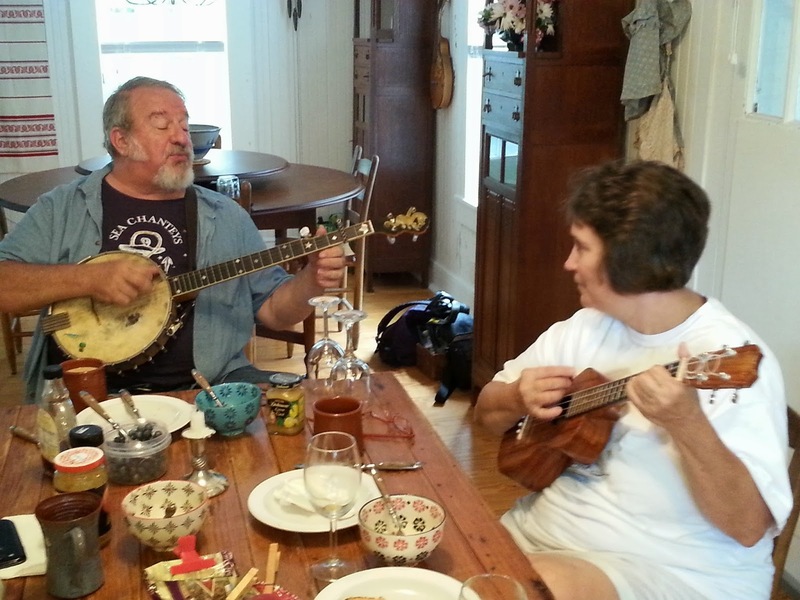 Bob Zentz, well-known folk musician, and his musical fiancee, Jean McDougal, are on the island this week, and will be performing at the Ocracoke Opry tomorrow evening. Bob has a repertoire of several thousand songs, many of them nautical tunes and sea chanteys. Bob & Jean are staying with us for a couple of days...and it doesn't take more than a thought, a word, or a hint to inspire them to get out their instruments and break into song. I took this photo Monday morning at the breakfast table. Bob and Jean entertained us for about an hour, playing and singing both traditional songs & ballads, and introducing us to some of Bob's original pieces. 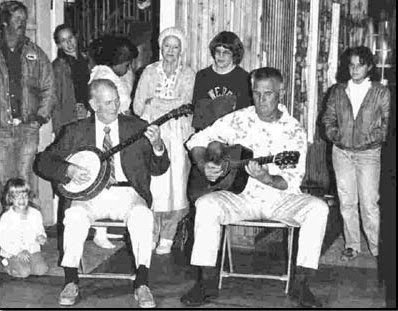 After sharing stories about colorful Ocracoke island characters, Bob played his song about a popular banjo player, Sud Bell (born 1882), last resident of Hog Island, on the Eastern Shore of Virginia. You can read the rest of the lyrics here: http://www.bobzentz.com/songbook/o.sudbell.htm. Times like this, shared with talented friends, add spice and beauty to island life. I recently discovered this photo in an old album. It was taken at South Point in November, 1981. If I remember correctly, the angler fell asleep as the tide was coming in. 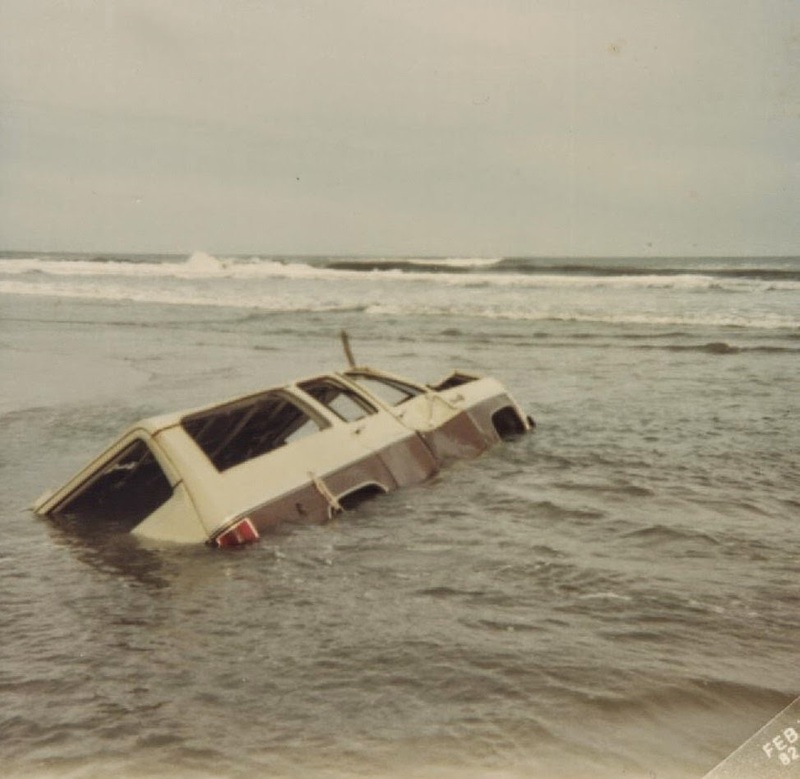 As far as I know, this SUV (or whatever is left of it) is still out there, having gradually sunk deeper into the sand. It wasn't long before it was completely covered up. The message: stay awake, and pay attention when driving on the beach! I had occasion to visit with David O'Neal at Down Point Decoy Shop a few days ago. As soon as I stepped into his store I was reminded of what a tremendous inventory of old and new bird carvings he carries. Dave was sitting at the counter, chatting with a customer about antique rifles and waterfowl hunting, when I entered. After the customer left I mentioned that I would like to come back with my camera, and take a few photos to put on my blog. Dave agreed, saying he always appreciated free publicity. When I returned I noticed that David had a copy of the 1986 National Geographic Traveler magazine on display. David was featured in the magazine, and his picture was on the cover. I remarked that he looked a little younger in those days. His mustache was definitely not white! That led to talk about how the senior years just seem to creep up on us without our awareness while it's happening. If you haven't been in Down Point Decoy Shop lately, be sure to stop by and check out David's wonderful collection of working and decorative decoys. And, if you are wondering why "Down Point Decoys" is located "Around Creek" it's because David started his business Down Point (on the lighthouse side of Silver Lake), near his family home...but he moved it Around Creek (on the Community Square side of Silver Lake) a few years ago. 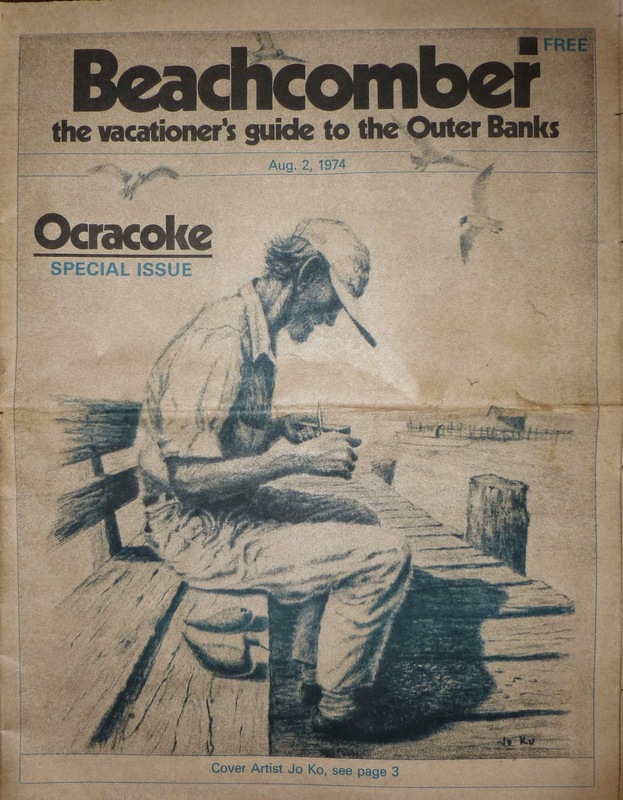 As a young boy I loved to listen to my father tell tales about Ocracoke. 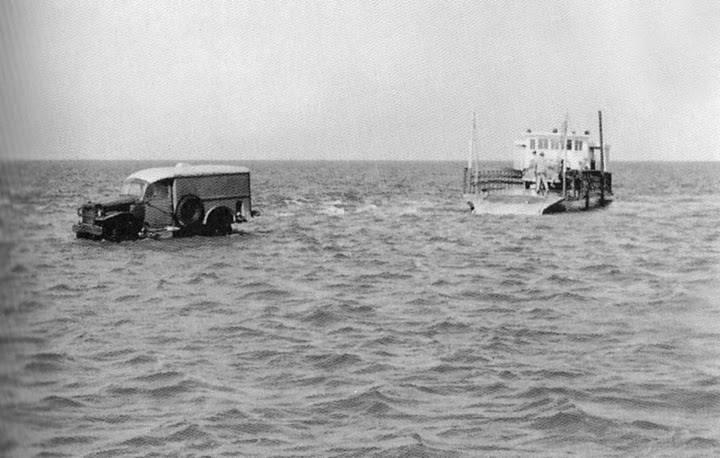 One of my favorites was the story of the “Ghost Ship of the Outer Banks.” On summer trips to Ocracoke we always borrowed my Uncle Marvin’s WWII army surplus jeep at least once, and drove to the north end of the island. Along the way we would stop at the wreck of the Carroll A. Deering. Since late February of 1921 the bow of the Deering, along with her heavy iron capstan, lay on the beach several miles south of Hatteras Inlet. The wreckage was distinctive. I would stare at the massive timbers and listen with full attention as my father retold the mysterious tale. 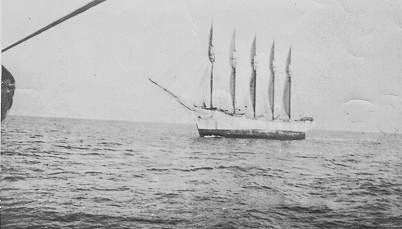 The five masted schooner, Carroll A. Deering, was launched April 4, 1919 by the G.G. Deering Company Yards in Bath, Maine. She was the last and largest ship that eighty-six year old Gardiner Deering built. Named for his youngest son, the massive vessel was just over 255 feet long, weighed more than two thousand tons, and carried six thousand yards of sail. She was impressive by any measure. 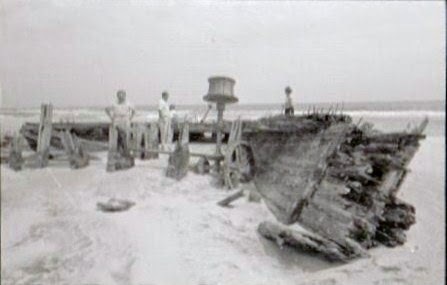 The Deering wrecked January 31, 1921. The sails were up, tables were set, and food was in the galley stove, but no crew members were aboard the vessel, just a cat. The Deering has become known as the Ghost Ship of the Outer Banks, and the mystery of her wrecking has never been solved. An Internet search will yield numerous links. Here is the Wikipedia article: http://en.wikipedia.org/wiki/Carroll_A._Deering. 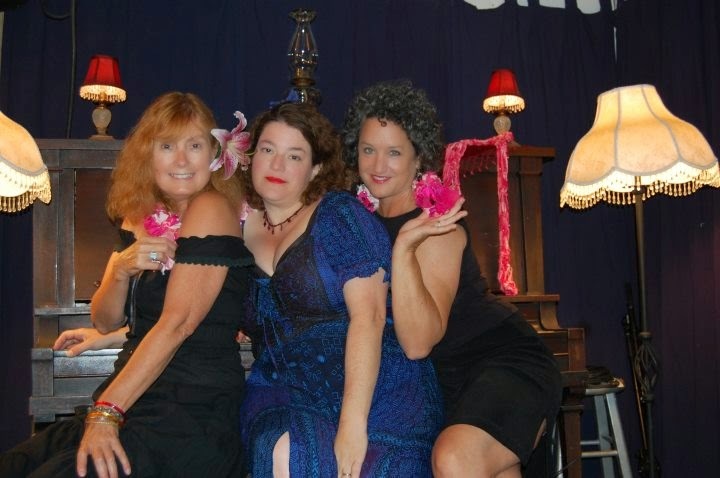 This Sunday, July 27, the Women of Ocracoke present "An Evening of Music & Stories" at Deepwater Theater on School Road. The performance begins at 7:30 pm. Space is limited, so come early to be sure to get a seat. And be prepared for a wonderful evening of stellar island talent. Admission is by donation only. All donations will go to the non-profit organization "Ocracoke Alive" to help support repairs to the skipjack Wilma Lee which was damaged during Hurricane Arthur. 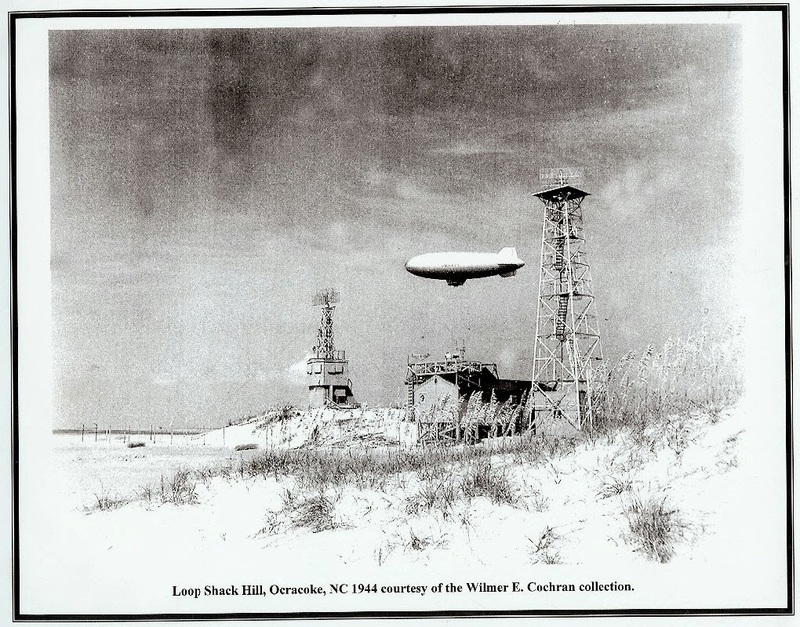 The Ocracoke WWII Navy Base was much more than the Loop Shack Hill installation (see earlier posts). The primary facility was located where the Coast Guard Station/NCCAT building, NPS Visitors Center, Parking area, and OPS museum, are today. Use the instructions on the right to enlarge the aerial photo below (courtesy of the Outer Banks History Center) to see the many structures & buildings (barracks, mess hall, hospital, water tower, etc.) which the Navy had on the island during the war. 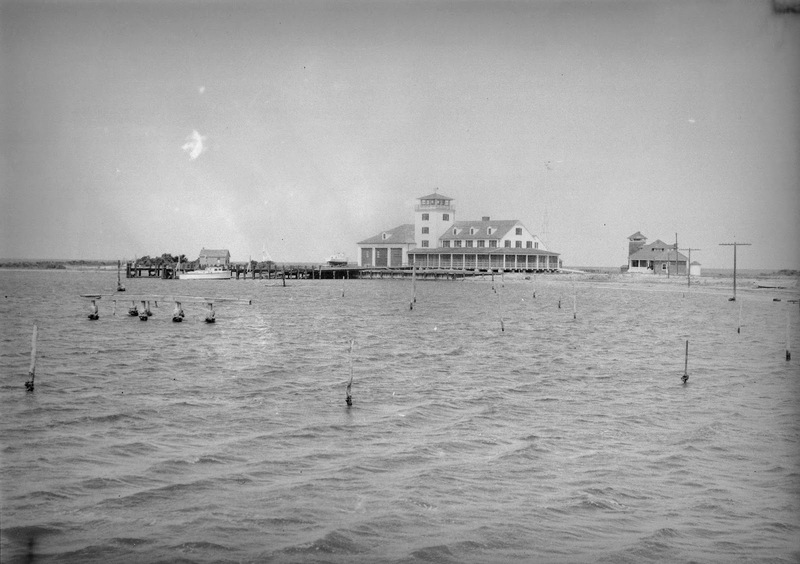 The WWII era photo below (courtesy OBX History Center) shows the US Coast Guard Station (now the NCCAT building ) with the earlier US Life Saving Station/US Coast Guard Station on the right. The old station was demolished after WWII. "This cover is a new print offered by Jo Ko, resident artist at Ocracoke, and the subject is alive and well at Corkey's Grocery. Wilbur Gaskill is his name and his mother is the oldest woman living on Ocracoke Island. "Wilbur exclaimed, "I love it here!" He agreed to pose for picture-taking at Silver Lake Harbor, the setting for many of Jo Ko's popular drawings. 'Wilbur has a bucket full of knives and is constantly buying new ones. 'It doesn't take long to wear one out carving as many birds as I do. I can't keep up with the customers. I carve seven or eight different kinds: Canadian goose, pelican, seagull, black skimmer, mallard, pintail and oyster catcher,' Wilbur said." Wilbur was 68 years old when he died in 1980. Jo Ko died in March of 2012, just short of his 105th birthday. Lou Ann's birthday is today. She shares this birthday month with at least nine other island friends. On Sunday evening we hosted a July Birthdays Potluck Dinner Party. The house was overflowing with people and scrumptious island delicacies -- boiled shrimp, corn casserole, baked pork, southern coleslaw, homemade bread, deviled eggs, rhubarb pie, and much more. Happy Birthday, Lou Ann...and everyone else, both on the island & off, who is celebrating a July Birthday! 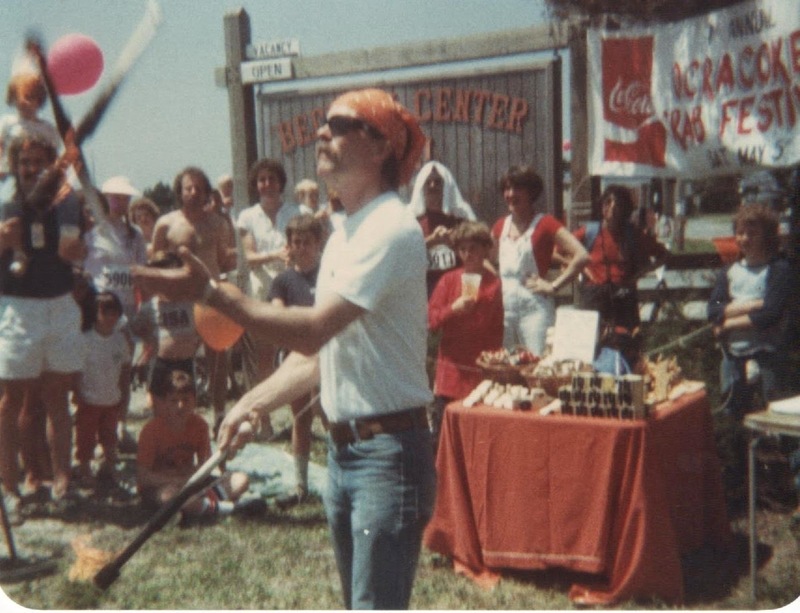 For six years...1984-1989...Ocracoke village hosted a Crab Festival in early May. There were contests -- fastest crab picking, tastiest crab recipes, crab pot pulling...and, of course, crab races! A King & Queen were crowned, as locals and visitors listened to down-home music, danced, watched jugglers & magicians, and browsed booths set up by artists and craftspeople. But the highlight was steamed crabs...almost 2,000 pounds of delicious steamed crab meat...and kegs of beer. Our latest Ocracoke Newsletter is a report on the Ocracoke Crab Festival. You can read it here: http://www.villagecraftsmen.com/news072114.htm. 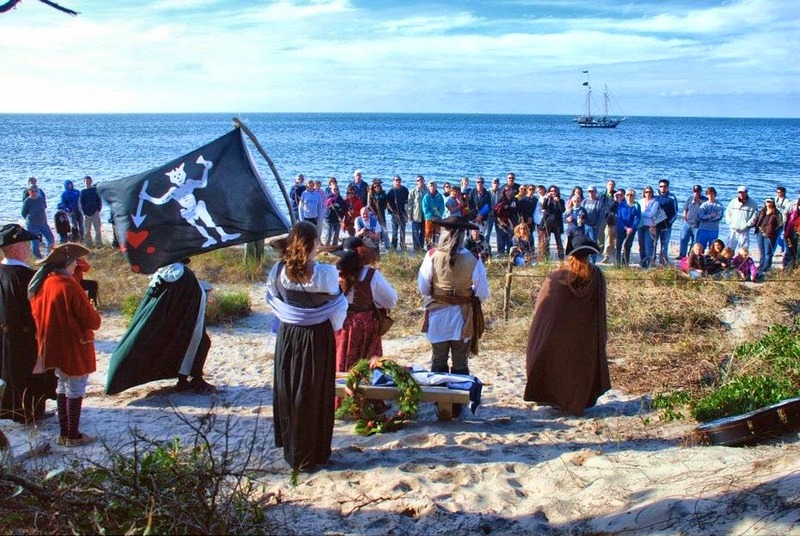 "Chart your course to Ocracoke Island for Blackbeard's Pirate Jamboree and a weekend of swashbuckling fun." "Canons will roar as members of Blackbeard's Pirate Crew invade Ocracoke Island by sea, featuring a three-ship battle in Ocracoke Harbor! "Take part in a treasure hunt, enjoy pirate activities throughout the village, send the kids to Scallywag School and indulge in hearty safarers grub and grog while you shop at the scandalous pirate markets and spend your doubloons on arts, crafts, and pirate gear. "Join in the Fun! Pirate Costumes Encouraged!" 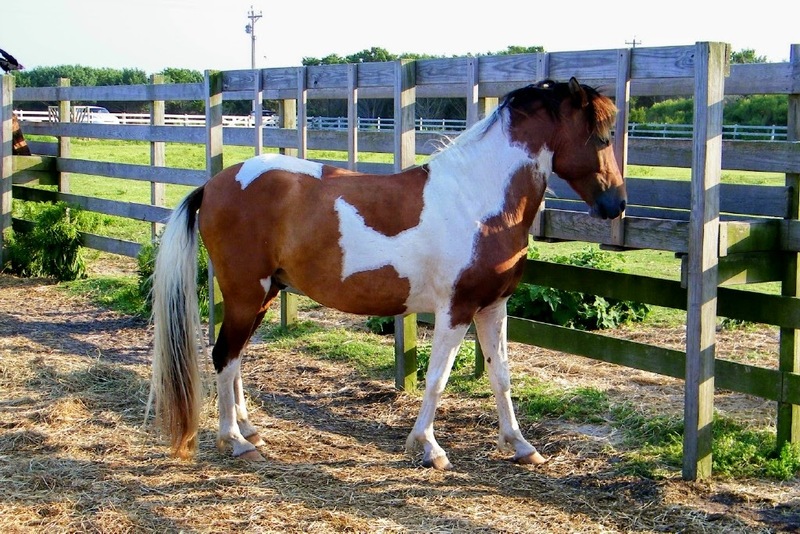 Islanders and visitors often wonder how the Ocracoke ponies, bird & sea turtle nests, and other wildlife manage during and after a major hurricane. Joycelyn Wright, chief biotechnician for the Cape Hatteras National Seashore, has written an informative article for the Ocracoke Current. You can read it here: http://www.ocracokecurrent.com/91327. ...and clams, all fresh from Pamlico Sound. 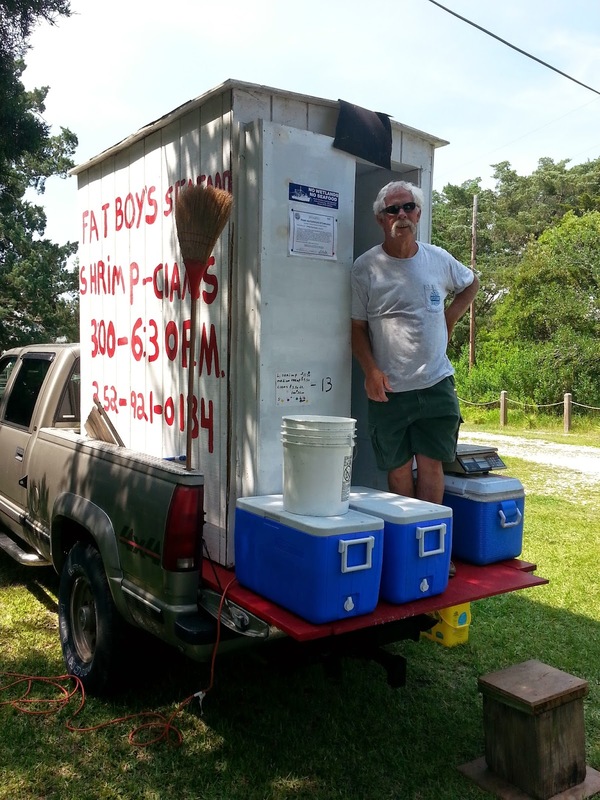 Stop by Fat Boys Seafood on Lighthouse Road most days between 3 o'clock and 6:30 to purchase the fixin's for your seafood dinner. James Barrie Gaskill, or his wife Ellen, is usually there to serve you, and to offer tips about how to prepare your meal. You might even get James Barrie to tell you the story of the Coast Guardsman who thought he'd arrived at the end of the world when he was stationed on the coast of North Carolina. Today at 1 pm the Ocracoke Community will gather at the United Methodist Church to celebrate the life of Maurice Ballance. Maurice was born on the island 87 years ago, and died last Friday, July 11, at his home. 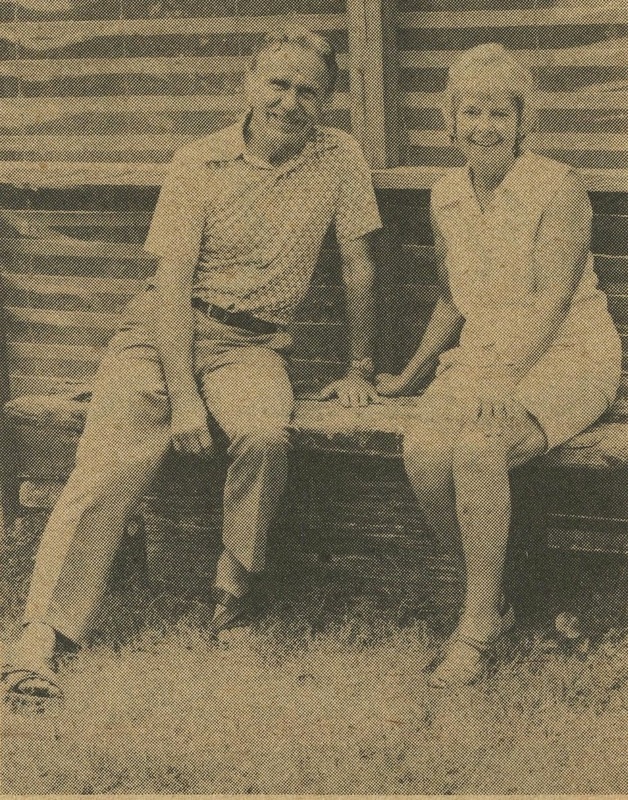 Maurice was a retired port captain with the NC Ferry Division, and had worked as a commercial fisherman and carpenter (he often worked barefooted!). He had a keen mind, and a native's appreciation for his heritage and island history. Maurice played guitar, and loved music. He entertained islanders frequently, especially with Edgar Howard before Edgar's death. 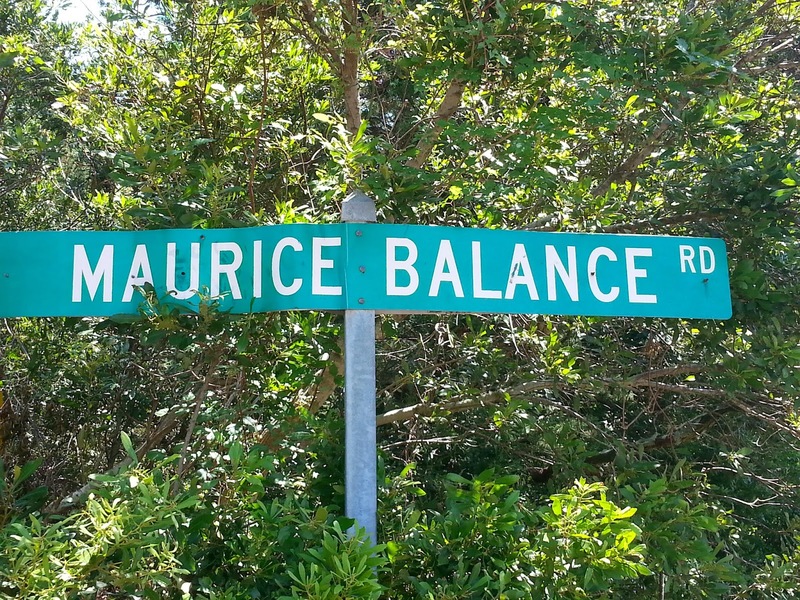 As a tribute to Maurice, several years ago Ocracoke village named one of our streets for him. 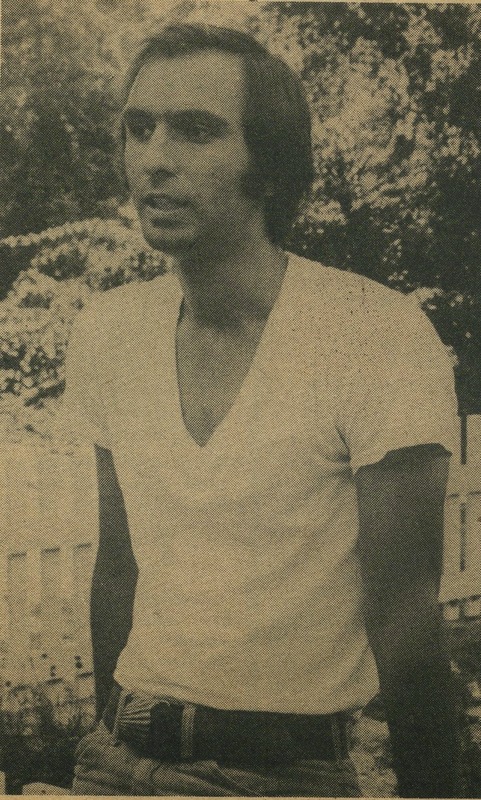 Maurice Ballance's obituary is available here: http://www.ocracokecurrent.com/91140. Farewell, Maurice. Rest in Peace. Hurricane Arthur Damages Skipjack Wilma Lee! Join our fundraising campaign by August 1st to get her back in the water! Great rewards for sponsors! This 4th of July was most unusual, bringing with it not the expected tourists, parade, sand castle contest, and Community Square party, but instead a Category 2 Hurricane Arthur barreling up the coast. On the night of July 3rd and early in the morning of July 4th, Ocracoke Island took a direct hit from Hurricane Arthur. The storm brought winds upwards of 100 mph for several hours and also packed tornado-type winds as well. The eye of the storm passed over the village of Ocracoke at around 1:00 AM on July 4th. The island suffered damage in the form of downed trees, broken windows, roofing, siding and trim torn from houses and buildings, road overwash, and over 40 utility poles snapped or dislodged. The Wilma Lee will be taken to a boatyard and hauled out for inspections and repairs. We are currently assessing and estimating the costs, but it is clear that because of a high deductible and a provision that excludes sail damage during a named storm, that we will need close to $20,000 that we currently do not have. We hope to repair the vessel so that it is able to take passengers for motoring trips and minimal sailing with use of the jib sail so that we can make the most of the remainder of the 2014 season while we wait for the creation of a new mainsail. In the meantime, we will continue our summertime educational Dockside talks once the Wilma Lee returns to her berth at the Community Square Docks. Mid-August we have another meeting with Andy Mink of NC Learn to look at the educational programming that we are developing for the Wilma Lee. 1. Join our Indiegogo Campaign! In June, we began a fundraising campaign to raise money for replacement of the sails. That platform is still in place and we are off to a good start at $1505 with 20 days left (as of this post date) and a goal for the sails of $10,000. We hope you will be able to pitch in and join our quest. Any monies raised over our goal will go towards the additional costs of repairing damage to the Wilma Lee. There are a lot of great perks, including T-shirts, cruises, a week’s stay on Ocracoke, and even your own private charter. Please note that many of the rewards offered involve cruises aboard the Wilma Lee – those may require modification, depending on the outcome of our inspections and assessments. Contributions are tax-deductible and the campaign ends August 1st. 2. Send a tax-deductible contribution directly. You can do so with a credit card through Paypal by clicking on the donation button here. 3. Join our “Boom and Sail Party.” If you can come to Ocracoke Island and are interested in joining us for a fundraising party, let us know and we will keep you posted on how to get a ticket to a fun-filled celebration to raise money for the Skipjack Wilma Lee. Email us at info@ocracokealive.org or call at 252-921-0260. She believes the decoy was made by Charles MacWilliams ("Charlie Mac" to islanders) because of a typed paper found with the decoy. The paper reads, "The wood in this hand-carved decoy came from one of the five masts of the schooner Carroll A. Deeering, wrecked in a great storm on Diamond Shoals off Cape Hatteras more than forty years ago [the Deering wrecked in 1921]. After she had been dynamited, one section of this famous Ghost Ship was driven ashore at Ocracoke Island in another storm, where I salvaged a mast. I carved this body from the mast, carved the head out of a natural driftwood knee found on the beach, and then painted the decoy. "Many a waterfowl has been shot over this decoy. Famous men like Lynn Bogue Hunt, artist; Dr. Edgar Burke, author and artist, and Rex Beach, novelist, who all gunned with me long years ago -- had good shooting over this hand-carved decoy! "October 15, 1963, Ocracoke, N.C. Charles MacWilliams"
I believe the woman is correct, and that the decoy was carved by Charlie Mac. In case you missed my article about traveling from Philadelphia to Ocracoke in 1951, you can now read it in the summer issue of the on-line magazine, Swan Quarterly. Here is the link: http://issuu.com/innerbanks/docs/sqly_summer_14_med. The article starts on page 27. Two days ago I re-published a blog post about Loop Shack Hill. I included photos of some of the extant structures. 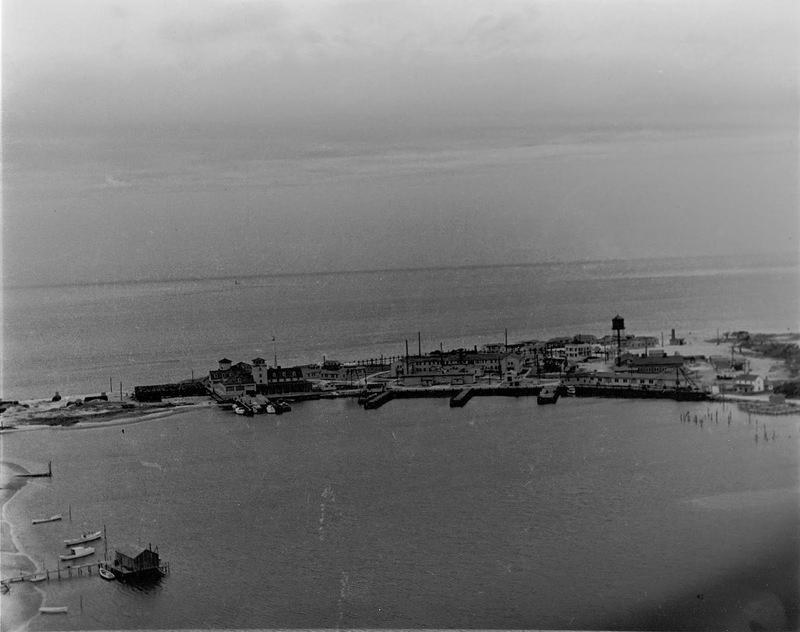 Below are two pictures showing what the installation looked like during WWII (the first courtesy of Earl O'Neal, the second courtesy of the Outer Banks History Center). The "Loop Shack" radar tower (with the wooden base) is shown on the left in the top photo; on the right in the bottom photo. I am a bit late posting this blog, but Hurricane Arthur interrupted the flow of my writing. Late last month Martha & Wilson Garrish celebrated their 30th wedding anniversary by throwing a lavish outdoor party for the community. Everything, including beverages, was free, but donations to the Ocracoke Community Park were requested. A good time was had by all, young and old alike...and donations went to a very good cause! Happy Anniversary, Martha & Wilson! Some time ago I found this whelk while walking along the beach. Constant tumbling on the ocean floor had worn a half dollar size hole in the shell, but I kept it anyway because otherwise it was fairly well preserved. Several days ago my grandson, Eakin, was looking at the shell, and he noticed something I had not seen. Lodged between the inner whorls is what appears to be a perfectly formed scotch bonnet. The smaller univalve is clearly visible from the hole in the whelk. This may not be one of the Seven Wonders of the World, but it is interesting, don't you think? The shad boat had a round-bottomed hull and a single mast that was rigged with a sprit sail (a four-sided fore-aft sail supported by a diagonally positioned spar called a sprit). The shad boat often included a jib and a topsail. Jim Goodwin recently finished a detailed model of a North Carolina shad boat. 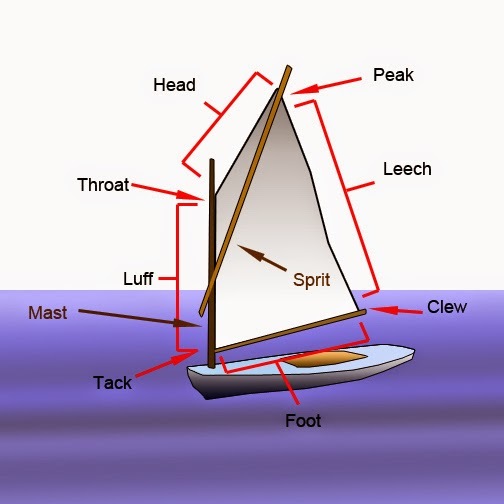 For landlubbers, here is a diagram showing the parts of a sprit-rigged sailboat. Summertime always brings sailboats into Silver Lake harbor. I took this photo, with the lighthouse in the background, several weeks ago. Even folks who are not sailors flock to the island and our surrounding waters. Kayakers, fishermen, clammers, surfers, & parasailors always find much to enjoy here at Ocracoke. During Hurricane Arthur I got these two questions that I didn't have time or energy to answer. I am replying now. 1. "Could you explain to this Dingbatter how the island generator works - for example, what is meant by '1/3 of the island will be powered' or what is the 'rotation schedule?' Also if folks have a private generator, which I assume is gasoline powered, do you plug things into it to run, say, your tv or icebox?" The Ocracoke generator is not powerful enough to supply electricity to the entire village at the same time...even when there are only year-round residents on the island. Three "trunk lines" service the village. Tideland Electric can supply power to only one of these lines when we are on generator. So they rotate service, usually in 3 hour blocks of time. Private, gasoline powered generators can provide electricity for refrigerators, lights, or even air conditioning, depending on the size of the generator. For example, the Variety Store has a generator that allows them to stay open during power outages. 2. "When a large tree is blown over, with the root bed exposed, is it possible to use a truck or equipment and set it back up? Would the tree have a chance of living after such an event? Just curious. I figure it is NOT possible, but just wondered." I have seen (and helped) neighbors prop up trees that have blown over in hurricanes. But it doesn't always work. Below are two photos. The first is a tree in my back yard that I have propped up. The second photo is of a tree in my Uncle Marvin & Aunt Leevella's yard that survived a hurricane many years ago, and continues to grow at a noticeable angle.